Some of the best parts of the holidays involve visiting friends and family. However, if your friends and family are outside of driving distance, you may need to fly. But what does this mean for your furry friend? We’ve compiled a list of tips and tricks to get you and your pup prepared for flying. We would recommend trying to keep the flight time as minimal as possible. Your dog will probably not understand why they’re on a plane and it could cause them a lot of stress. Try to book a direct flight to your destination whenever possible. Layovers will only add stress to your canine companion. If a direct flight is not possible, try to keep the number of flights to a minimum. Before you leave, you should schedule an appointment with your veterinarian, as well. You want to make sure that your dog is in good health and OK to fly before you hit the tarmac. You also can obtain any paperwork that you may need to board the plane. For example, many airlines will ask for a dog’s health certificate, often within 10 days of your flight departure if traveling internationally. Make sure you know what vaccinations and proof of health you need to have before you attend your vet and get all documentation you need. You should find a carrier that fits your pet the best. 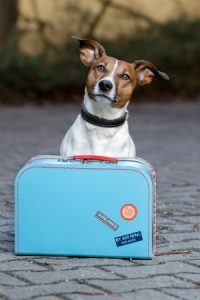 When traveling with dogs, it’s important to remember that their carrier must follow the same rules as carry-on baggage – it must be able to fit beneath the seat. You also want to get a carrier that is large enough for your pet to get up and turn around in. Bring Fido recommends that you start shopping early to find a suitable carrier and give your pet a few days to get used to it, as well. We all have heard horror stories about airlines losing luggage, but that could be an absolute disaster for your pup. When packing your bags, keep your dog’s essentials somewhere with you whenever possible. This includes food, treats and toys, as well as plastic baggies to pick up after your pet and bowls to provide food and water. Flying at elevation can dehydrate your dog more quickly, so you’ll want to make sure you can provide your pup with a drink after you land. Do you have any questions about flying with smaller breeds? Are you looking to add a new miniature pup to your family this holiday season? Whatever your needs, call Pauley’s Pups today at 804-798-7877 or stop in and see us and our adorable pups on Washington Highway in Ashland, Virginia.